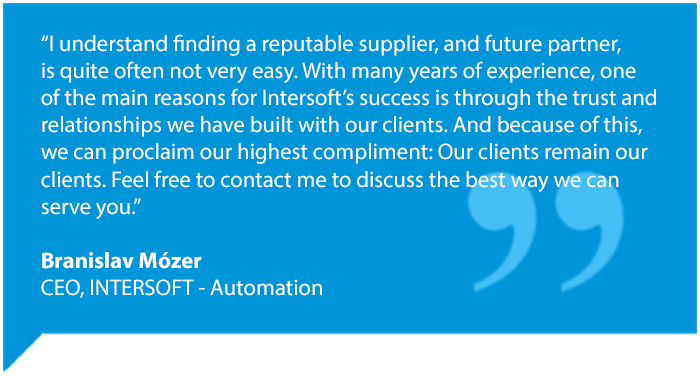 Intersoft-Automation, founded in 1993, is a private company located in the Czech Republic. We design, construct and manufacture electrical control cabinets for industrial automation. 85% of our production is for customers in the European Union and Switzerland. Our longevity and success are due to the many years of experience of our 60+ employees and a complete focus on the customer needs and requirements, with a high degree of flexibility. Additionally, we supply the planning and designing of hardware and PLC software. Experience: Over 20 years in Designing, Programming, and Commissioning all hardware and software for our Custom-Built Electrical Control Systems. Quality: We proudly supply the Highest Quality and Reliable brand-name parts and craftsmanship. Reliability: Consistent and Dependable - Guaranteed. You are not only purchasing our product, you are purchasing our reputation. Service: We know first-hand the value of providing outstanding service. And through our guaranteed service, everyone (Intersoft, our Clients, and their End-Users) benefits.